This marks Thomson’s second stint inside the Octagon. The 34-year-old went 2-1 before parting ways with the planet’s most prestigious mixed martial arts promotion in 2004. “The Punk” has alternated between wins and losses over his past four fights. 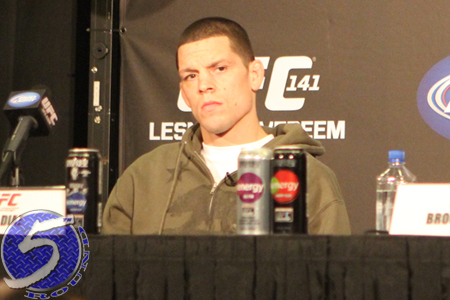 Diaz was last seen dropping a unanimous decision to reigning 155-pound champion Benson Henderson. Mr. 209 had rattled off three straight victories prior to December’s defeat. Speaking of Henderson, “Smooth” headlines the freebie fight card against Diaz’s homie, Gilbert Melendez. FOX broadcasts the main bouts live beginning at 8PM ET/5PM PT. HP Pavilion in San Jose, California hosts the festivities.